Lean cuts of steak contain nearly the same amount of fat, saturated fat and cholesterol-per-serving as boneless, skinless chicken breasts. 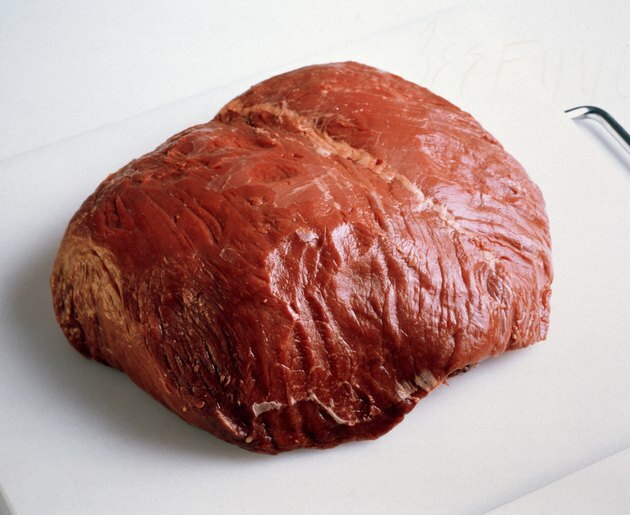 In addition, lean steak has only slightly more calories in a 3-ounce serving than cooked chicken. The steaks that contain the least number of calories in a serving come from the round or loin section; avoid adding excess calories to these steaks and use a low-fat cooking method such as grilling, broiling, baking or braising. Although they are low in calories, it's best to eat lean steak only in moderation: Too much red meat is linked to an increased risk of cancer and heart disease. 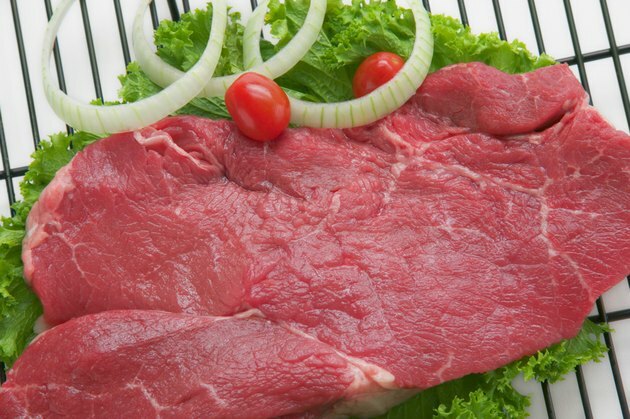 According to BeefRetail.org, a 3-ounce serving of cooked bottom round steak contains 139 calories, making it the lowest calorie steak available. Because it's so lean -- each serving has less than 5 grams of total fat, with 1.7 grams of saturated fat and has less than 60 milligrams of cholesterol -- bottom round steak is best cooked in moist heat to keep it from becoming tough. Try braising or stewing the steak with chopped vegetables in a covered pot in the oven. Bottom round steak can be broiled, but only after it's been marinated to help tenderize the meat. Also known as charcoal steaks, knuckle sirloin-tip steaks or round sirloin-tip side steaks, sirloin-tip side steaks contain 143 calories in every 3-ounce serving. This cut of steak is a good choice to slice thin and saute briefly, advises the Certified Angus Beef site. Make a small amount of the beef stretch further by stir-frying it with vegetables like green beans and carrots, and serving with brown rice. Sirloin-tip side steaks can also be marinated and grilled, braised or pan-broiled. 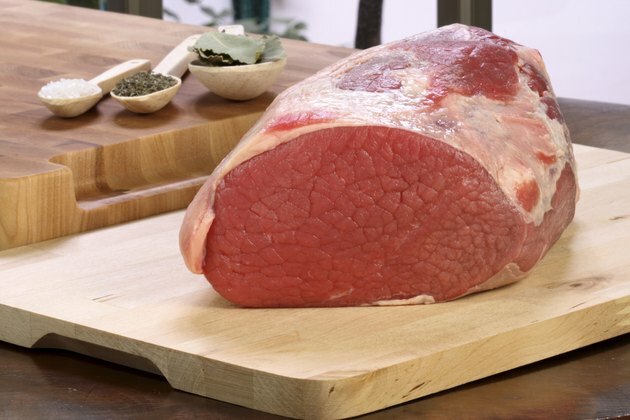 Eye of round steak is cut from the eye of round roast, sometimes also called the round-eye pot roast. A 3-ounce serving of cooked eye of round steak contains 144 calories and is lower in fat, saturated fat and cholesterol than bottom round steak or sirloin side-tip steak. Like other low-calorie cuts of steak, eye of round steak is so lean it can become dry, unless it's cooked with plenty of liquid. Try preparing it in the slow cooker or in the oven, braised that calls for a long cooking time at low heat. Pan-broil or grill eye of round steak, only after it has been marinated. 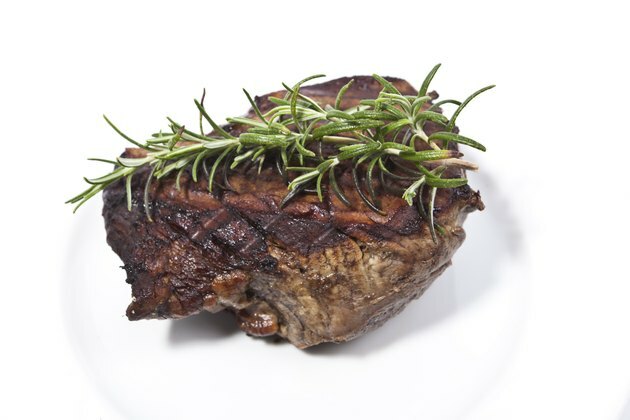 Round tip steak contains 148 calories in every 3-ounce serving of the cooked beef. 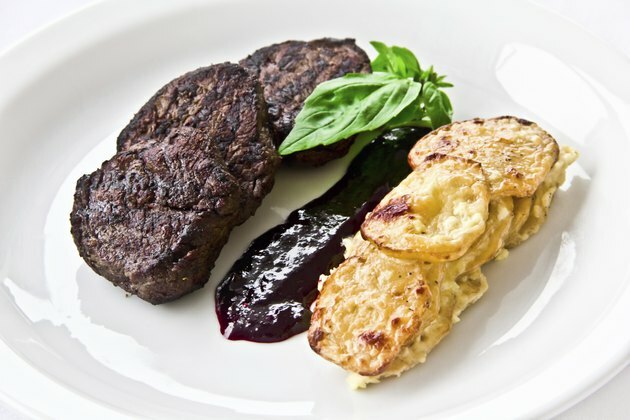 The steak may be labeled under a variety of different names, including sandwich steak, trimmed tip steak, breakfast steak and sirloin tip steak. Some of these cuts -- especially those termed sandwich or breakfast steak -- are sliced extremely thin and are suitable for pan-broiling. Thicker cuts can be marinated, then grilled or broiled, although they can also be used in stir-fries, sautes and braises.